For those of you who don’t play Left 4 Dead, you will have to take my word for it that this is a joke :). The costume I wore to the party this year almost beats my record for lazy costumes. I had a bag full of old costumes, you see… so I laid them all out, and just changed into and out of various costume pieces throughout the night. I greeted people as Batman, then changed into the Grim Reaper, followed that up with a werewolf… it was fun confusing people for a while, but after about an hour I gave up. Definitely second place for laziness though. A couple years ago I wore a sticker that said “Hello, my name is Steve”. I bet that that night nobody was as Steve as you. He was very, very Steve. More Steve than even Steve. I thank you, kind sir. Even looking at the wiki you linked, it took me a minute. A lot of people at the the party I went to didn’t get my Rick Grimes costume. They thought I was a real cop. 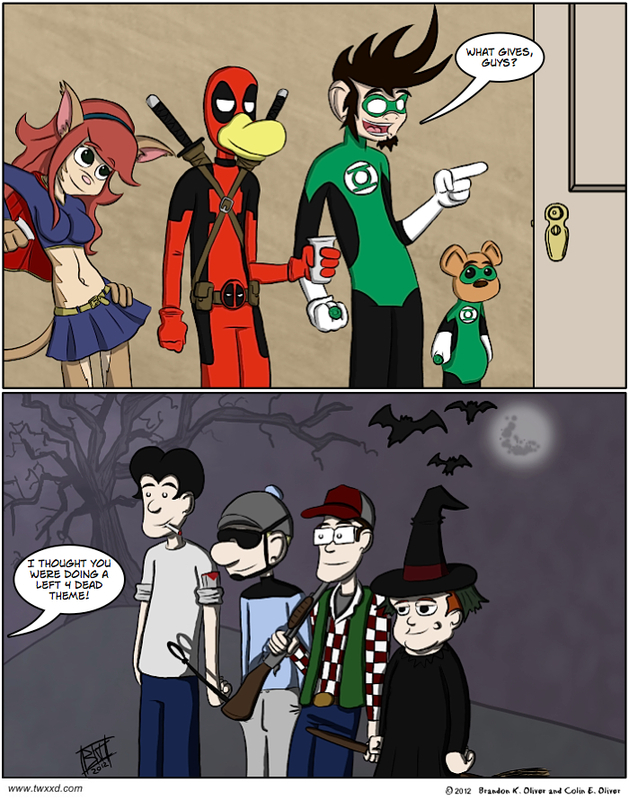 That little Green Lantern is just the most adorableist! I still give full points for wit on that one.